They were all bundled up in thick winter coats with the hoods up, and she had a scarf closely wrapped around her neck and face. I assured them that I was OK and kind of went, “Why?”. He gestured at my bare feet (and maybe he had seen me limping a bit—the reason for my Gymnopodal Therapy). I assured them I was just fine (and then he asked me again, and I answered again). The only really believed me when I said I was out enjoying Nature. For Pete’s sake! It was a sunny, 50° day (10°C). Yeah, there was a bit of a breeze, but I also had on a nylon shell windbreaker under my T-shirt, and a long-sleeve undershirt under that. It was glorious! This was my first hike there since the rupture and it was interesting to see how I did with all of the elevation changes. 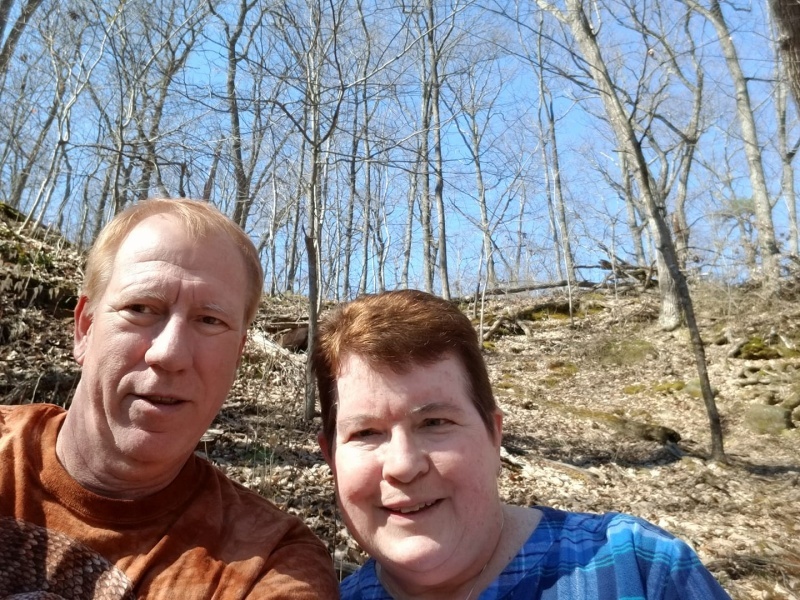 (You can maybe see the switchbacks behind us.) I did fine. I felt pretty good on that hike, so later in the day I was pushing myself a bit (tried to walk a bit too fast) and twinged myself. Ook. That was a setback. As I’ve mentioned before, the big problem is that the Achilles tendon is the one that lets you push off as you walk. When you stand on the balls of your feet, that’s the Achilles tendon (and the calf muscles attached to it) that is supporting you. And I really cannot do that. The tendon tends to scream when I try to put full weight on it (and the speed at which one loads the tendon matters, too), and then even when I do, the calf muscle has atrophied horribly. When I try to put weight on it, even slowly and gradually, the most my calf muscles can handle is about 110 pounds (which, as you might guess, is less than what I weigh). When in good shape, your body (tendons/muscles) ought to be able to handle closer to 2,000 pounds (for example, when running or jumping). So anyways, after twingeing it I was pretty discouraged and spent the last week rather babying it (and myself), only building back up near the end of the week. But by yesterday and my physical therapy it was feeling mostly OK again. 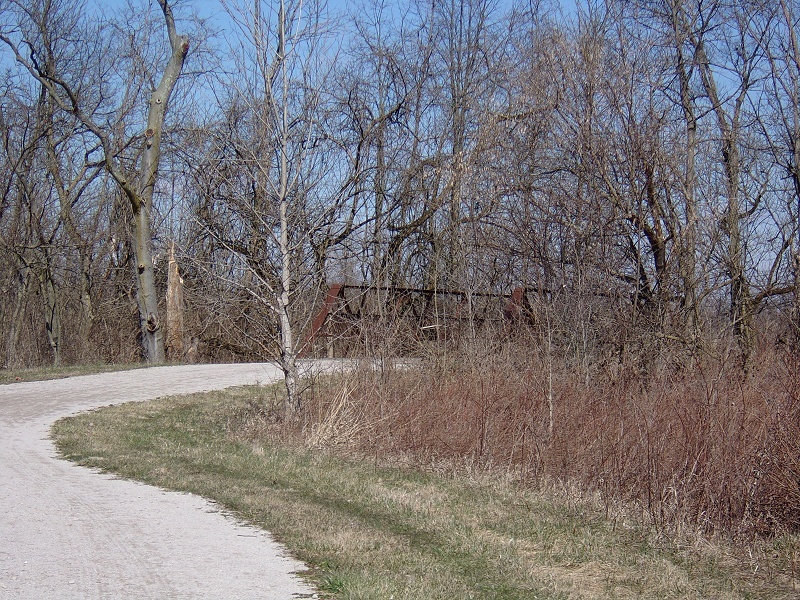 By the time that couple passed me and asked me if I was OK, I had hiked about 2.1 miles on the fine gravel. I was OK, but I was also getting tired. I could tell that my Achilles was feeling a bit stressed and the muscles needed to rest. But I also knew I had another 0.6 miles to go. The achy part of the tendon was mostly on the left, so I realized that I could relieve that a bit by pronating more, putting more weight on the right side of the ball of my foot. You can do that while barefoot. When you have shoes on, the molded shape of the shoe really restricts the ability to shift weight around and actually use all of the structures of the foot. So that increased pronation really helped. And then I realized that that increased pronation was also engaging my big toe more. And then I realized, holy schmoly, the tendons that work my toes also go up into my calf, but they are different tendons that are perfectly fine. 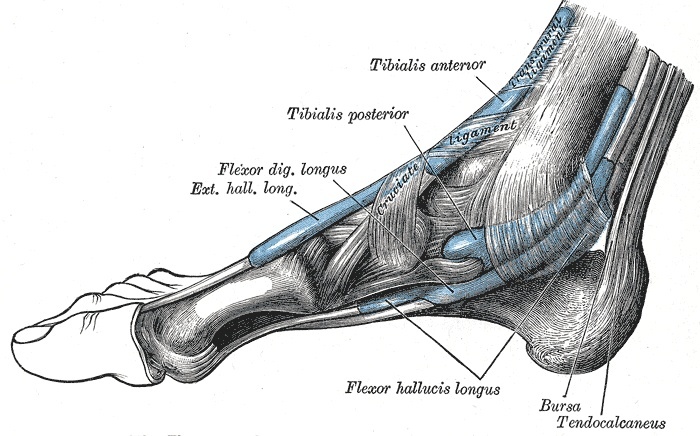 The flexor hallucis longus tendon works the big toe, and the flexor digitorum longus tendon works the smaller ones. You can see that they are separate from the Achilles tendon, which is way at the back attached to the heel bone (the Achilles is called the “tendocalcaneus” here). So I kind of scrunched my toes to make sure that I was engaging them more fully with the ground, and found that I could use them to do quite a bit more weight-bearing than I had on just the ball of my foot. Now I was using all those tendons, the good and the repaired. Try that wearing shoes! Gymnopodal Therapy! So I did the final 0.6 miles with no problem for a new post-operative total of 2.7 miles. I have to admit my toe muscles (the ones in my calf) were a bit tired—they’d atrophied in the past 3 months, too. But hey, they need the workout too. One final thing I noticed: remember how I was concerned that my soles would peel from the inaction (again, it even happens to astronauts who stay a long time in space where their soles get nearly no stimulation). Well, I noticed my heel was peeling a bit. Yeah, pretty much, particularly after being rather discouraged earlier in the week. I still have a long way to go, but it definitely looks like I am on my way to some sort of decent recovery, particularly when I can pull some “barefoot” tricks. I really do think that Gymnopodal Therapy is an integral part of that. I get these concerned looks often. Recently, the usual “winter” one of: “Aren’t you cold?” I assured the concerned lady I was fine, and it wasn’t that cold, she replied with a little exasperation in her voice, “You’re just like my husband!” Good for him! A guy on the bus going to work today kept offering to bring me some shoes !! I told him I already had shoes, he said he’s seen me many times on the bus with no shoes and how he gave some pillows to some homeless guy in the mall and now he wanted to help me !! He didn’t seem to understand that I don’t want shoes and I put my shoes on when I get to to work in the bank. Think I’ll get a different bus today.